Dougie has been doing puzzles for years. He loves the wooden ones with the pieces that drop into little slots. He especially likes the ones that make noise when you put the piece in. 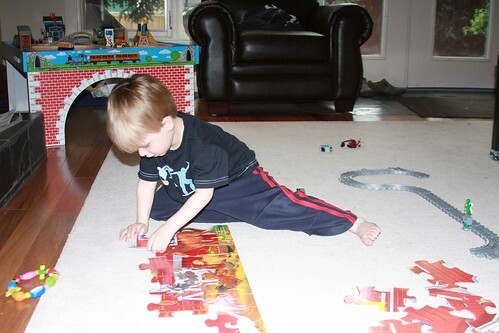 We have been trying to get him to do real puzzles for a while but he just didn’t get the concept of putting the pieces together. 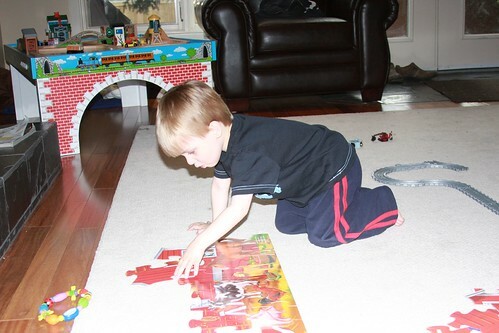 His speech therapist started him with an opposites puzzle. 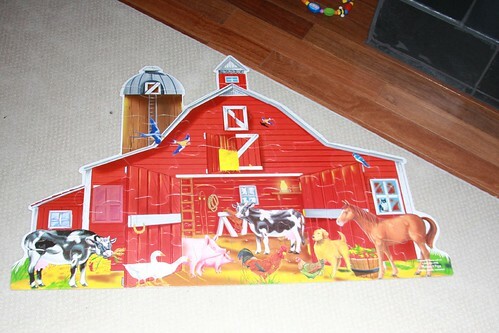 They were little two piece puzzles with two opposite pictures (dirty boots/clean boots, asleep/awake, etc). 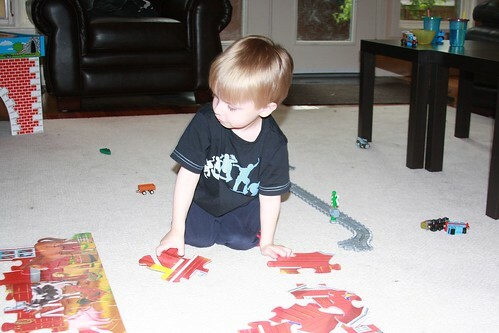 He started to understand the concept but still had trouble putting the pieces together. Enter Thomas. Dougie loves Thomas and was highly motivated to build his own tracks on the floor. He couldn’t figure out how to get the tracks together though. They are shaped very similarly to puzzle pieces – you can’t just push them together, you need to lift one and place it on the other. After a few demonstrations, Dougie got it! We decided to try a puzzle again to see if he could apply the concept. I have to help Dougie a bit with the top part. The pieces are quite similar and he hasn’t mastered the art of finding the right “next” piece but he’s getting there. He’s already started to look for patterns on the piece he’s working on and then trying to find another piece that has a similar pattern. He likes the animal part at the bottom best though.